Happy Monday friends! Hope you all had a wonderful weekend! We were quite busy with a lot of errands, Jackie & I had a venue visit in New Hampshire & of course watching the Royal Wedding! After this weekend, we've officially purchased all the "big" items for the nursery so I wanted to give you a glimpse of what we're planning! If there is an interior designer gene, then I don't think I have it! While I'm fairly certain with things I like and don't like, styling is not my forte! Alas, I did have a vision of what the nursery would look like and the colors I would use! Gary and I have set out to create a room that serves two purposes - guest bedroom & nursery! After selling all the furniture that was previously in the office, we started on the nursery! I knew I wanted all the furniture to be white with blush and grey accents. While there's no real "theme" to the room, I wanted it to be airy & light. After testing out about a dozen grey paint colors we decided on Bunny Grey from Benjamin Moore - just had it darkened up 10%. Gary's parents gifted us this glider that we absolutely love. Seriously Gary sits in the glider working and watching TV - can't get him out of it! When I say set up was easy, I mean it came in two pieces and you just had to slide the back onto the bottom piece - beyond easy! Something tells me the rest of the furniture will not be so easy to put together! I really wanted the crib to be convertible & we found a few that we liked, but ultimately decided on the Delta Children "Sutton." Storage is our biggest issue when it comes to this room. Since the closet houses all of Gary's clothes, we needed to find furniture that had a lot of storage for the baby clothes. We decided on a dresser, shelf & day bed all from Ikea! We have a few other Ikea pieces around the house and the quality is really on par with other higher end brands for a fraction of the cost. I know a lot of people have used the Hemnes 8 drawer dresser and just changed up the knob pulls, which is what we'll do. I really like these from Home Depot & these from Anthropologie. The day bed actually comes out to be a full size bed which will be perfect for guests & mostly for my mom since she'll be staying with us for a while! It also has storage underneath which I'm so excited about. As for the little details around the room - that's where Etsy, Target & Home Goods have come into play. I have found so many beautiful prints on Etsy that you can download and print on your own! We added some cute woven storage bins that we found at Home Goods & I'm leaning towards a few fun accent pieces from Target. The rug is from Rugs USA and is actually not round, it's rectangular and will fill most of the room since we have wood floors. I also found these adorable star hooks from H&M and I have no clue what I'll use them for yet, but I'm sure I'll find something! I want to add a mirror of some sort above the dresser & I'm stuck between something more modern or a little more whimsical like this mirror. These are definitely more of the "big" items and all the little details is what will really pull the room together! I'd love to know where you love to shop for home decor pieces! Could’ve foooled me, I think your taste is great and this sweet design collage proves it. A comfy chair is soooo important because you will spend a lot of time in it. Cute pieces and happy Monday! I love your vision board! It looks so pretty. The nursery is going to be so cute! I can't wait to see it all come together! I love all the furniture! Her room is going to be perfect!! I love your color scheme and all the pieces that you picked! Can't wait to see it come together and the day bed is the best idea! I love what you're planning! Can't wait to see how it all comes together! It is going to be such a great space! And we have that bed in Avery's room and it is awesome! The fact that it doubles in size and has storage are SO helpful! I absolutely love the color palette you chose! I can’t wait to see how everything looks, it’s going to be such a gorgeous space! Love the grey and blush theme! I think you picked great pieces, especially that bed with the storage! Can't wait to see it all together! It’s going to be the sweetest little room! IKEA for the win always. I love love the color theme. I know the room is going to be so amazing. That day bed is such a great idea. Full size and storage?? Perfect. I can't wait to see the finished room! It'll be beautiful! I love all your nursery picks!!! We have the Bethpage with is super similar to the Sutton. You are going to love it! 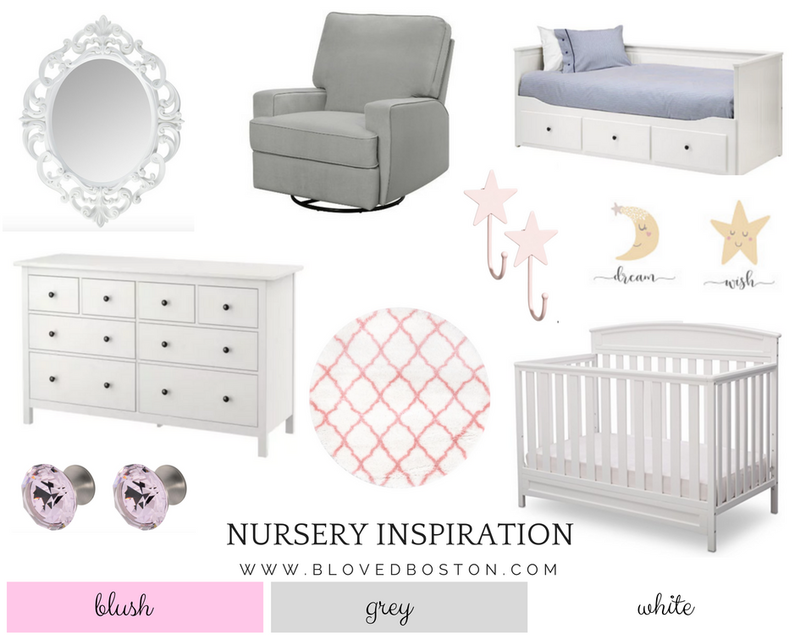 Zoe's nursery is grey, blush and white too. The colors are so relaxing. I really love that daybed. I could have really used something like that in Zoe's room when she was younger and not sleeping through the night! I spent the first 6 months of her life out in the living room on the couch most nights. I know everything is going to come together perfectly for you guys. Grey is such a perfect backdrop for a nursery! If and when we have a third, we won't find out the gender, so the neutrality will be perfect. Also, I can't wait to see the whole room pull together! Sounds like you have accomplished your needs really well to me and made it look good! I love the colors. I love your thought process for the nursery, it will turn out beautiful! I've heard such great things about Ikea's furniture, but haven't purchased anything. I think eventually I will, especially if they're on par with a lot of higher end brands. Aviah's room is dark grey (the furniture) with hints of white, blush, and green. I went with a garden theme. I found quite a few decor pieces at HomeGoods and Etsy, too. The prices are SO good! Getting back to the furniture, we also purchased a changing table that had a lot of storage because Eddie also has his clothes in her room closet. Haha, girl, we've taken over the bedroom closets, haven't we?! Lol! Thanks for sharing your nursery ideas and I hope you're having a great start to your week so far! I'm so excited for you! I love the color scheme! I definitely think a glider is a must! So cute! I love your nursery inspiration. Love the cool tones. I can't wait to see the nursery when it's all put together. I love the color choices & that chair DOES look super comfy! The vision board looks amazing! I can't wait to see the nursery come to life! Oh Biana, it's going to be just beautiful! I can't wait to see the end result! Olivia had (still has) a pink and gray nursery and I don't ever want to change it. I'm still happy with it all these years later! That dresser really is the best for baby stuff (especially diapers that seem to fit perfectly!). I just wish it was a few inches shorter (for me) since we use it as a changing table also, but you guys definitely won't have that problem, lol. I can't wait to hear what you think of the daybed-- we eventually want to switch out the full bed we have in there for a daybed so we have more space once Mason gets bigger and it becomes more of his room vs half a guest room. You made great choices and I think it is going to look great! You can't beat IKEA for great pieces and storage! I cannot wait to see the finished product! I cannot wait to see it all come together!! I love your inspiration! So pretty. I love gray.. we have four different rooms in different shades of gray. We choose a convertible crib as well.. eight years and we are still using it as a toddler bed for my second child. Looking forward to see how it all comes together. Enjoy it and have fun. I remember when my first was born. Thanks for hosting and I hope that you have a wonderful week. I can't wait to see pictures once you have the room all together. Sounds likes its gonna be super cute! The nursery is going to be amazing! Seriously HOW GORGEOUS was the Royal wedding?! I woke up and watched- so happy I did! Cannot wait to see what you guys do in the nursery!! So fun to follow along! I LOVE ALL OF THIS!!!! I can't wait to see the nursery come together because these are the perfect baby girl details!! So excited for you, B!